In general I have given up arguing free v.s. paid content strategies. The terminology being used: ‘free’ v.s. ‘paid’ is in itself some assurance that in a recession many publishers are going to start charging for their online editions. Never mind that the debate is really ad supported v.s. subscription supported v.s. a hybrid of the two. And, never mind that if you sketch out a ‘paid’ strategy thinking ‘free’ is the other alternative you are probably going to get it wrong. So in the short term some will get it wrong, possibly horribly wrong. But those paying attention to the fact that digital has changed our culture will hopefully get it right. And ‘right’ can include some level of subscription fees, the question being what cost, what content and what platforms. But, the number one way to get it wrong is to believe that because content is expensive to produce, readers must and will subsidize its creation through subscription fees. Assuming you are entitled to be paid for something is not really a sound economic argument, especially in the face of an unlimited supply of information driving down the perceived value of your content. Disclaimer: the chart is for entertainment purposes. I am not an economist, not even on TV and the curves here are purely diagrammatic. 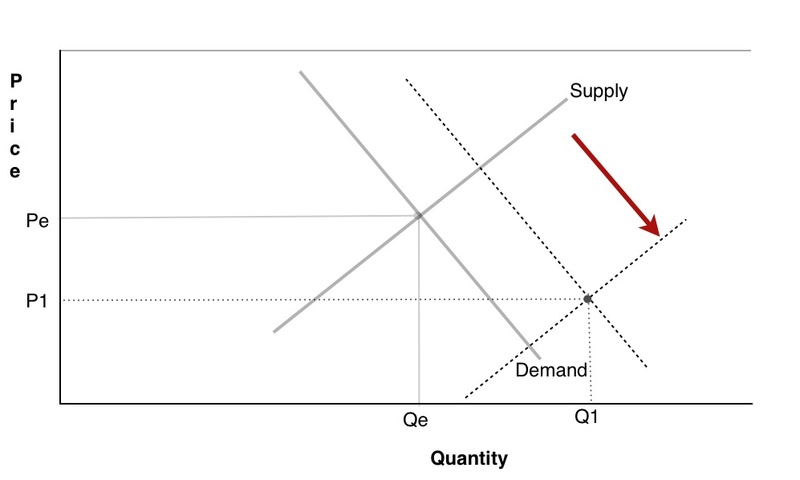 If this was showing a real information demand curve the ‘supply’ line would be so far to the right as to be off the page bringing the quantity (Q1) with it and dropping the price equilibrium (P1) to zero. Economics 101 is when supply increases prices decrease. In this case we could argue demand has also increased but not enough to match a limitless supply of information. So what we have is an oversupply of information. Not news, not journalism necessarily, but information. And guess what, consumers are exhibiting a behavior that indicates 5.5 hours per day of ‘information’ on Facebook is at least a minimally acceptable substitute for paying for a daily newspaper or watching the evening news. If the news is important it will find them. Assuming there are any newspapers left to cover it.